Charlotte Checkers rookie forward Zac Dalpe grew up less than two miles away from the hometown of Wayne Gretzky, heard stories about Gretzky everywhere he went, and spent much of his youth playing in a rink which was named after the hockey legend. While there can be only one Wayne Gretzky, Dalpe is now well on his way to carving out his own spot in the National Hockey League. The Carolina Hurricanes prospect is averaging a point per game in the AHL this season and sits atop the league's rookie scoring list with 43 points (18-25-43) despite playing in just 43 games. Dalpe has recorded multiple points in 10 of the 43 contests and has endured only one three-game scoreless drought all year. "I've always wanted to be a consistent hockey player, and that doesn't necessarily mean points or a point per game," Dalpe said. "The points have come, but I want to be a consistent guy whether it's on the power play or penalty kill, a guy that you can rely on." Charlotte head coach and general manager Jeff Daniels, an assistant on the Hurricanes' 2006 Stanley Cup championship team, likes what he's seen out of the 21-year-old rookie. "He's a great skater, and he has a great release, a very quick shot. He's either scoring on his shot or creating some offense just by getting pucks at the net," Daniels said. "For me, one of his big pluses is just his love for the game. He loves coming to the rink, just wants to get better, wants to make that next step, but also knows he has to put in the time here to become a better player. He's got a great attitude." Dalpe is a native of Paris, Ont., just a stone's throw away from Gretzky's hometown of Brantford, and he has a simple answer as to how he first came to be involved with hockey. "I'm from Canada, so you don't really have a choice." Growing up a little more than an hour away from Toronto, Dalpe cheered on the Maple Leafs as a kid but also rooted for the Vancouver Canucks and one of his favorite players, Pavel Bure. When the Leafs and Canucks squared off, Dalpe bucked the household trend. "I would cheer for the Canucks," he said, "which would bug my dad quite a bit because he's a big Leafs fan." Dalpe, who adorned his bedroom wall with a large poster of boyhood idol Joe Sakic, played plenty of hockey himself and soon determined that he would give it a shot as a career. It proved to be a good decision. After moving away from home and suiting up for one year of Junior "A" hockey in British Columbia, Dalpe was selected by Carolina in the second round (No. 45) of the 2008 Entry Draft. From there, he moved on to Ohio State University and led all Buckeyes freshmen with 25 points (13-12-25) in 37 games during the 2008-09 season. His sophomore campaign would prove to be even more successful, as Dalpe paced the entire Ohio State roster in both goals (21) and points (45). "When you're a freshman, some of those boys are big," he said. "You kind of get pushed around a bit as a freshman -- or at least I did. Your second time around, you know what the atmosphere is going in." 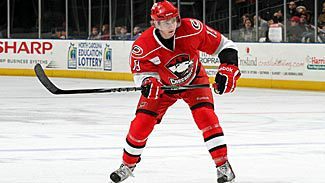 After the Buckeyes' season ended, Dalpe got his first taste of the pro game when he signed a tryout with Carolina's former AHL affiliate in Albany, N.Y., for the remainder of their campaign. He made quite an impression, racking up 6 goals and 8 points in just nine regular-season games -- including a hat trick in his fourth contest -- and adding 6 more points (3-3-6) in eight postseason tilts. "You don't know what to expect when (players) come in from juniors or college, how they're going to adapt to the new level," Daniels said. "But he came in, and I think because of his speed he was able to make the transition fairly smoothly. The pace picked up, and he was a good enough skater to keep up to the pace." For Dalpe, the brief stint in Albany couldn't have gone better as he prepared to turn pro. "Nothing but positives. I didn't really know what to expect to be honest, and having some success was great," Dalpe said. "Obviously coach Daniels and [assistant coach Geordie Kinnear] put me in a good spot right off the start, and I saw that they had trust in me. It was a huge thing, and it made me kind of know what to expect coming into this year." Dalpe worked over the summer to build up his strength for the rigors of the pro game and was one of the Hurricanes' standouts at the annual prospects tournament in Traverse City, Mich., last fall. He continued to impress as training camp progressed, and when the dust settled, Dalpe found himself on Carolina's opening-day roster and bound for Finland to play in the NHL Premiere series against Minnesota. "It was awesome." Dalpe said. "You just have to go (to camp) and bring what you do best. I think my speed is something I like to bring to the game, and I've worked hard at getting faster. I'm also a guy who likes to shoot the puck a lot -- not in a selfish way, but just to try and create offense." While Dalpe registered an assist in his first game, he went scoreless in his next six contests and was a healthy scratch for three others. Carolina assigned him to its new AHL affiliate in Charlotte on Oct. 31, a day before Dalpe turned 21 years old. "One of the biggest things was when I was up with the Hurricanes, I wasn't playing that (top-six forward) role, and in the past I was playing that role, so the confidence might have gone down a little bit," he said. "When they sent me down, coach (Paul) Maurice said that he really wanted me to get my confidence back and start producing. That sort of jump-started me mentally to want to do well, so it was great to come here and get after it right away." 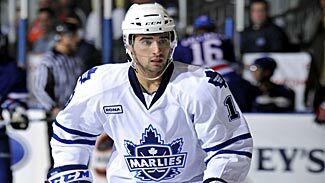 Much like his late-season stint in Albany the previous spring, Dalpe arrived in the AHL and quickly began to make life miserable for opposing defenses. As one of the Checkers' key cogs on offense, the 6-foot-1, 195-pound forward rattled off a five-game goal-scoring streak in mid-November and ended the month with 14 points in his first 14 games. So much for that lack of confidence. "Once he got here, he was playing a bigger role and playing the power play, killing penalties," Daniels said. "With that came confidence. He likes to shoot the puck, he gets on a roll, and all of a sudden he's scoring in four or five in a row. There haven't been too many streaks where he hasn't produced for us." Dalpe secured another call-up to the Hurricanes in late December and promptly tallied his first NHL goal in his first game back, a 6-3 win over New Jersey on New Year's Day, and scored again in Carolina's next tilt. He was returned to Charlotte a couple weeks later but responded by collecting 11 points (2-9-11) in a five-game span after the reassignment. "I don't like to sit and pout about getting sent down," Dalpe said. "Going back to the whole learning process of being a first-year pro, I know it's going to happen. Hopefully in the future I'm a full-time NHL player, but you have to make the best of every situation you're in." Throughout Dalpe's multiple stints with the Checkers, Daniels has observed major strides in the rookie's faceoff ability and positioning while away from the puck and in the defensive zone, elements that will be key to his role increasing in the NHL. "In time, he'll be a regular (in Carolina)," Daniels said. "I think he'll be able to produce because of the skill set he has. Whether it's this year or next year or whenever, when he gets there, he'll definitely do everything he can to stay up at that level, and I think he'll be a very productive player up there." Dalpe has been on a bit of a yo-yo between Charlotte and Raleigh this season -- he earned another one-game call-up in February -- but he'll know it's a good sign when he needs to change his living arrangements in North Carolina's capital. "I just stay in a hotel when I'm in Raleigh for now," he said, "but hopefully it'll be an apartment soon."